Moving Planet: A Day Move Beyond Fossil Fuels was a blast yesterday! People biked (and walked/bused/drove) in from all over the city to celebrate at South Lake Union Park. 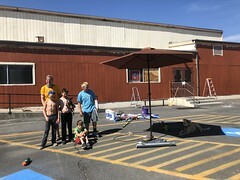 The boys and I traded bike helmets for pirate hats (for them) and nautical scarf (for me) and were volunteer skippers at the model boat pond, helping set up kids up with Pirate Pond Boats. The boats were lots of fun, but we didn’t get a chance to explore the festival. Before things got too busy on the pond, I met Kelli of Yoga for Bikers who was setting up to conduct a yoga class using bikes as yoga props. One of these days I hope to go on one of her YoCycle rides. Once our shift at the pond ended, I brought my bike over to the Family Bike Expo so people could test ride it. Morgan had a lot of cool bikes on display, including my friend’s Madsen that got taken for spins by nearly everyone at the park–I wasn’t sure my bike would be enticing enough. But after a while it got three or four test riders…including a tall guy, which is always funny to watch. His wife tried it out, too, before they took off on their bike train. And it really was a bike train: mom riding solo, oldest kid riding solo, dad pulling trail-a-bike and bike trailer. They like having the trailer behind the trail-a-bike because it keeps it stable. I have yet to try a trail-a-bike, but apparently they flop around a bit. Very fitting theme for today’s ride (more info here). She mentioned she might do a European ukulele tour on a Brompton folding bike. What a life! I can’t get the “embed video” to cooperate, but here is the local Fox coverage of the ride. No riding today. I’m really screwing up this round’s 30 Days of Biking. I’m not as sick as I was the first five missed days, but I’m sick that sleeping all day while the boys and broken-shoulder Mr. Family Ride drove to the beach sounded like a great plan. I’m pretty wimpy when I’m sick and this lingering cough is making me slow and whiny. Wah. It was a great event and I’m delighted to have met you! I would have liked to join the Safe Streets Social, but it was getting to be too long of a day for my son. I’ll post photos soon! Great to meet you, too! I saw a really good photo of your son among the compiled Moving Planet pix (various photo sites linked to from the Moving Planet Seattle Facebook page. I still can’t believe my guys lasted as long as they did–plus we drove (boo, hiss) to a housewarming party afterwards! We’ll have to meet up on the trail soon. Oh, thanks for pointing that out! There are a couple of great photos of him. The sail boats were definitely a hit! Yes, I’d love to meet up some weekend!